Penstock can be used in sewerage system, community water supply systems, irrigation, hydropower etc. Here we will restrict our self to its application in hydropower sector. In Hydroelectric projects the same headrace tunnel can be used as penstock depending upon site situations and project requirements. Penstock is usually made of Mild steel as it provides better resistance against corrosion and with minor frictional losses. Penstock is controlled by gated structure at its upstream, in order to stop its supply in case of repair/maintenance in turbines, a control valve is also provided at hydraulic turbines. 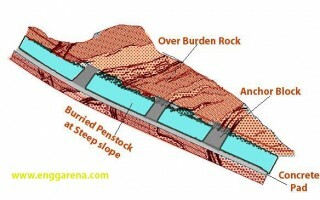 Penstock can be surfaced or buried depending upon the topography and site constraints, however it is suggested to make some excavation and take penstock through it so that it can be prevented from corrosion and other surface issues i.e. from animals etc. As penstock carries water at tremendous pressure it exerts a thrust on penstock at critical points e.g. junctions, bends etc, if it is not supported/anchored it may cause damage and the penstock can shoot up in the air. In order to prevent this thrust penstock is provided with anchor blocks at different intervals.